The 34th Bata-the Sunday Times Most Popular Schoolboy Cricketer of the Year 2013 competition is approaching its sixth week for this year but Thurstan College’s Minhaj Jaleel’s position as the leader of the main competition is virtually inaccessible to those trailing in his wake. He just crossed the 9000-vote range and now has a commanding margin of 5562 votes over his nearest rival A.K. Tyron of Richmond College Galle. Just as in previous weeks, Minhaj continues to gain more votes as he strengthened his tally with an additional 1928 last week, bringing his total count to 9036 votes. Meanwhile Tyron’s tally increased by 83 from last week to finish oat 3474 votes while St. Peter’s College skipper, Dushan Hemantha, has boosted his campaign with an additional 225 votes. Dushan’s count reached 2321 as he managed to bring down the deficit against Tyron to 1153. As the remaining slots among the top five are filled by Dinuka Wickramanayake of Trinity College and Madawa Nimesh of Royal Panadura, the entire line-up has remained unchanged from last week. 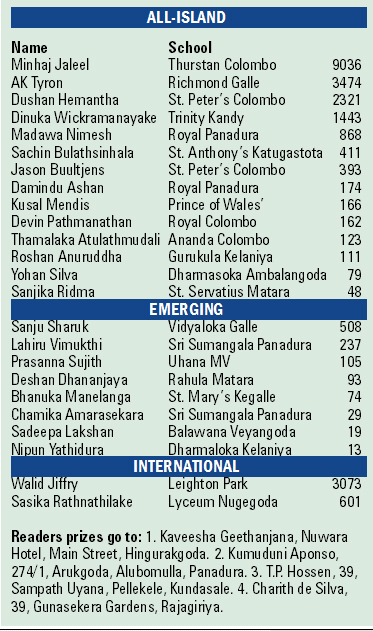 In addition, three cricketers from the list, Damindu Ashan of Royal Panadura, Kusal Mendis of Prince of Wales’ and Yohan Silva of Dharmasoka Ambalangoda have failed to gain a single vote during the last week. Sanju Sharuk of Vidyaloka Galle has done enough since he made a sudden entry into the Emerging category three weeks ago. This is his third week as the leader in this category and his closest rival, Lahiru Vimukthi of Sri Sumangala Panadura, languishes 271 votes behind him. Prasanna Sujith of Uhana MV Ampara popped up into third place pushing Deshan Dhananjaya of Rahula Matara into the fourth slot. Behind Bhanuka Manelanga of St. Mary’s Kegalle, Chamika Amarasekara of Sri Sumangala Panadura made his entry into the competition at the sixth position. Walid Jiffry of Leighton Park continues to enjoy sole leadership of the International Schools category, as his tally went beyond 3000. Jiffry’s only rival, Sasika Rathnathilake of Lyceum Nugegoda, lies far behind but made a great improvement from last week by securing 526 votes in a week. Coupons for the 34th Bata-the Sunday Times Schoolboy Cricketer of the Year 2013 competition will appear in Wijeya Newspapers’ dailies- the Daily Mirror and Lankadeepa- and also in its weekend English publication, the Sunday Times. Readers will be able to send in as many coupons as they wish in favour of their favourite schoolboy cricketer until the deadline on May 30.